Our middle son, Zachary, who is 13, has had a growth spurt this summer. He went from being just slightly taller than I am to quite noticeably taller. I now have to look up to look him in the eye and he has developed the habit of standing beside me and leaning on my shoulder. We've been hearing a lot of people exclaiming, "Zach sure sprouted up!" Some of the people saying it are family, but a lot of them have been people from church or teachers at the school or just people we see in the community. They see Zach now and then, so changes in his appearance are obvious, but they don't know him well enough to know about his interest in dangerous animals or that he enjoys cooking and baking. They don't know that he absolutely loves to read and often comes to us saying he needs a new book to read, which is tough when he has read everything appropriate for his age that we own and at our local library. It's probably the same with many of us. We know the people around us well enough to see how they change in appearance, but we don't often go beyond appearances to really get to know them. Thinking about this lately has made me wonder if there's a problem there, at least as far as the church is concerned. Jesus told his disciples "A new command I give you: Love one another. As I have loved you, so you must love one another. By this everyone will know that you are my disciples, if you love one another" (John 13:34,35). By this everyone will know that you are my disciples. If you stop to think about it, there's a lot of consider in that one little phrase. By this, meaning by the love we show to one another within the church, everyone, both inside and outside the church, will know that we are His disciples. 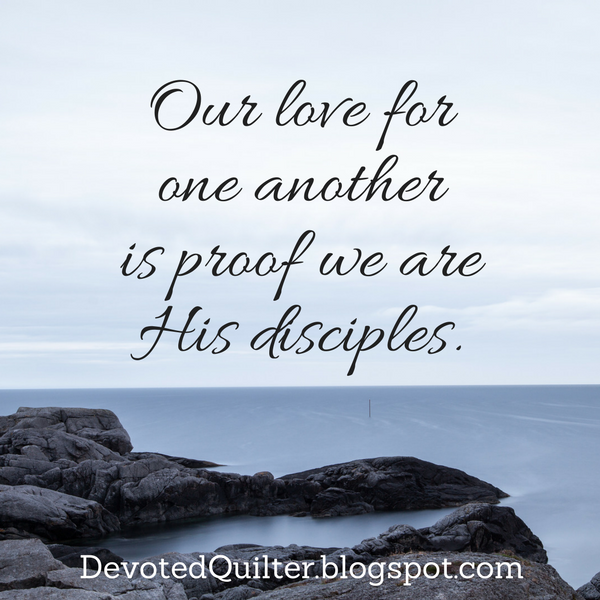 Which means that the love we show to one another is proof that we are disciples of Jesus. Which begs the question: Can I truly love someone if I know almost nothing about them? Unfortunately, I am guilty of knowing the names of the people who attend our church, but not knowing anything else about them, with the exception of a few friends. I have nothing against the rest of the church, and I would help them if I knew they needed something, but that's not quite the same as loving them, is it? That could more accurately be described as neighbourly-indifference, and I don't think that's what Jesus meant when He said, "As I have loved you." I think Jesus meant something a little deeper, something that goes beyond appearances and chit chat about the weather. And I think I need to work a little harder on it. What about you? Great thoughts. I think you're right.